Goalkeeper Igor Akinfeev said Russia's game plan had been to hold on for a penalty shootout after the host nation beat Spain on spot-kicks Sunday to reach the World Cup quarter-finals. Spain dominated the last-16 match but after centre-back Sergei Ignashevich gifted them the opening goal on 12 minutes, Russia drew level when Artem Dzyuba converted a penalty awarded for a handball by Gerard Pique shortly before half-time. Akinfeev saved Koke's penalty to give Russia the advantage. After Denis Cheryshev converted his spot kick, Akinfeev stopped Iago Aspas's effort with his legs to spark mass celebrations in the Luzhniki Stadium in Moscow. 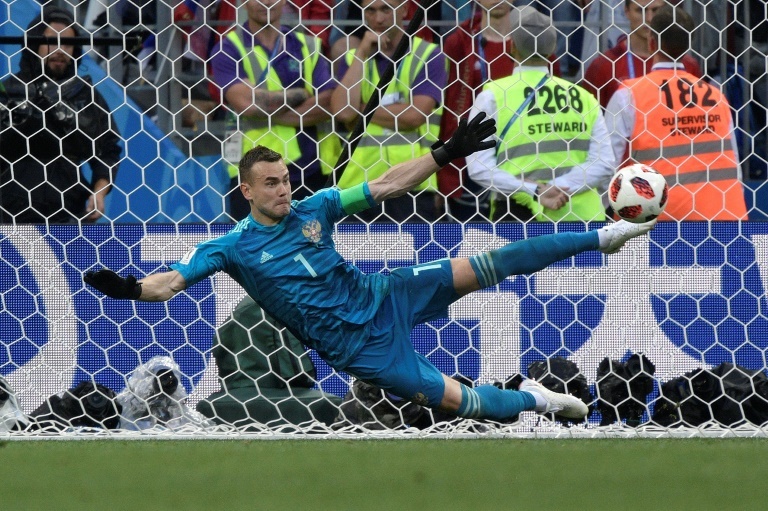 "We were hoping for penalties," Akinfeev said. Russia coach Stanislav Cherchesov said: "We spent two years working on this and did a good job".